Bengaluru, Nov 12 (IANS) Prime Minister Narendra Modi flew into Bengaluru on Monday night and paid respects to Union Minister Ananth Kumar at the latter's residence in the city's southern suburb where his body has been kept for public to pay homage. Landing at the state-run Hindustan Aeronautics Ltd (HAL) airport in the city's eastern suburb from Varanasi in Uttar Pradesh, Modi drove to Kumar's residence amid tight security. 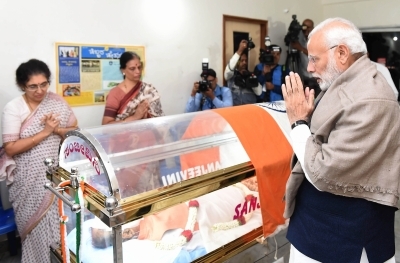 After laying a wreath on the glass casket draped in tricolour in which the body was kept, Modi consoled Kumar's widow Tejaswini.